ASCE student chapter at UConn is part of the national organization, the American Society of Civil Engineers. The goal of this group is to provide students insight into what a Civil Engineer encounters in the professional and social environment. We help to connect and network Civil and Environmental Engineering students to current professionals and job opportunities through seminars, field trips and careers fairs. ASCE also supports clubs that allow students to apply their classroom learning to practical and fun projects such as the Steel Bridge Club and Concrete Canoe Club. In 1949. Chi Epsilon was organized to recognize the characteristics of the individual civil engineer deemed to be fundamental to the successful pursuit of an engineering career, and to aid in the development of those characteristics in the civil engineering student. To become members, students must rank in the upper one-third of his or her civil engineering class and be enrolled in civil engineering or a closely related curriculum and have completed at least one-half of the work required for their Bachelor’s degree. The Concrete Canoe Association is a student organization dedicated to build a concrete canoe and to participate in a nationwide competition each year. The students are given a standardized hull design and the ASCE National Concrete Canoe CompetitionTM Rules & Regulation book. It is a challenge to design an appropriate concrete mix, to choose the best type and amount of reinforcement, to apply both materials in a way to match the given hull design, to transport the canoe to the competition venue and to be in physical shape as well as skilled enough to look good during the canoe race. The three best teams receive a monetary award and a trophy, but all what matters is the joy of having participated in such a competition. The UConn Student Chapter of the Earthquake Engineering Research Institute allows undergraduate and graduate students to learn about the fields of Earthquake Engineering and Structural Dynamics. Throughout the school year, EERI organizes lectures and industry tours where students can deepen their knowledge of Civil Engineering by understanding the effects of earthquakes on structures and how to mitigate earthquake hazards. Members can also participate in the Seismic Design competition at the annual EERI Conference where they must design, build, and present a balsa wood structure which will withstand multiple ground motions. The University of Connecticut Green Building Club is a student organization dedicated to providing students an opportunity to learn about sustainable building and to network with professors and professionals who are involved in the discipline. The club will investigate matters such as sustainable construction, LEED certified building processes, efficiency retrofitting, and low impact building techniques. For the next semester, there are plans for speakers, tours of green buildings on campus, and entry in the NESEA design competition. The club is open to students of all areas of study. While a background in engineering can be useful, it is important to remember that this issue requires a multidisciplinary approach. ITE-UConn is the Institute of Transportation Engineers’ student chapter at the University of Connecticut. IT-UConn promotes advancement of transportation and traffic engineering by facilitating interaction between students and professionals through hosting speakers and sponsoring technical and social activities. The organization strives to generate interest in transportation among students by organizing a variety of informational and social activities. Past activities are professional speakers, field trips, transportation-themed game shows, visiting other ITE student chapters, attending state and regional ITE meetings, organizing transportation symposia at UConn, semester parties and more. ITE-UConn is a great place to meet experts in transportation and traffic engineering and to foster professional growth. Any student (undergraduate or graduate) at UConn can be a member of ITE-Uconn by paying a nominal membership fee. We have a blog site at http://uconnite.wordpress.com/ where you can read our members’ ideas and thoughts. We are also on Facebook, where you will get up to date news and upcoming events information and loads of our pictures. 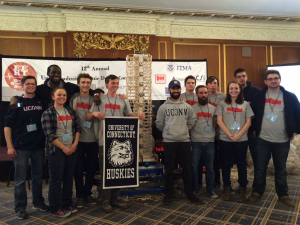 The UConn Steel Bridge Team is a volunteer club that participates in a nation-wide competition sponsored by the American Society of Civil Engineers and the American Institute of Steel Construction. Students are tasked to design, detail and fabricate a steel bridge that is approximately 21 feet long, 3 feet wide and 3 feet tall. Specifications require that the bridge must be fabricated with many small components that can be connected together to during competitions that are held at various regions throughout the country. The top teams from each region are invited to the national finals to compete for the national championship. 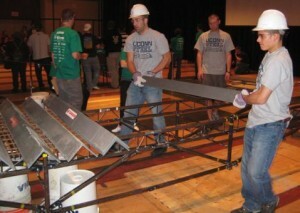 Teams are judged on speed of assembly, bridge weight, and deflection under a load of 2500 pounds. 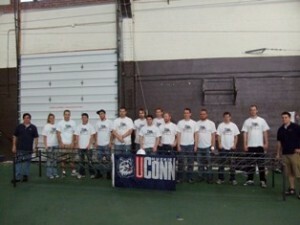 The UConn Steel Bridge Team has been competing for over ten years and has qualified for the national many times including the last five consecutive years. Practitioner Advisor: Michael Culmo, CME Associates, Inc.